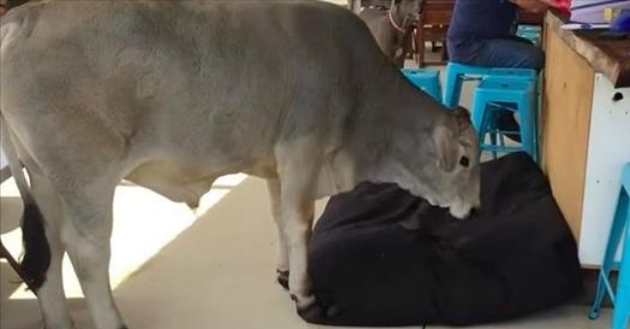 A cow named Radar knows he deserves to be comfortable — and he's pretty sure the dog bed is actually his. The video showing the dog-like qualities of cows caught the attention of the animal-loving internet recently — and was shared thousands of times. "That's not your bed! You're too big for the bed!" the woman narrating the video says. As the hefty cow settles down on the inflatable bed — and the air can be heard whistling out of it — the woman breaks out laughing. "Whose cow does that? You're not a cow are ya? Good boy." And perhaps it's not so surprising that this cow is such a "good boy." Cows have been shown to be very smart and sensitive beings who can form friendships and remember the past. In 2012, a group of neuroscientists even issued a declaration saying that many animals, cows included, have the brain mechanisms associated with conscious awareness and emotions. Responses to "Cow Is Pretty Sure He Fits Perfectly On This Dog Bed"